My name is Justine and I am from Grand Rapids Manitoba. I first came to Brandon in the fall of 2014. I am a long time employee of the BU Early Learning Centre, and I enjoy working with the children and the great staff there. I am also a member of the BU Beading Babes. I immensely enjoy my time with these amazing ladies; these pillars of the community make me feel privileged to be present when they’re all together. I can usually be found on campus at the Indigenous People’s Centre visiting with my friends, having soup or studying. I am also the Cultural Coordinator of the BU Aboriginal Student Collective. I enjoy serving the Indigenous students of BU, most of whom I’ve come to consider my friends. I am honoured to nominate Justine Hutcheson, a Metis student who is very proud of her Northern Manitoba roots. Justine is currently working towards her pre-professional requirements for the Ultrasound Technician program at Red River College. During her studies at BU, Justine has been such a positive presence in the Indigenous Peoples’ Centre (IPC). She is always so friendly and helpful to new students, welcoming them to the “IPC Family”! Over the three years I have known Justine, I have seen so much growth in her confidence and approach to school and life. 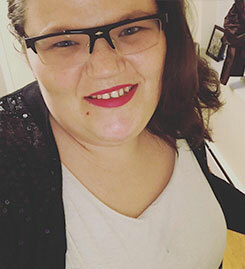 For the 2018-2019 academic year, Justine took on the role of Cultural Coordinator the Brandon University Aboriginal Peoples’ Collective (BUASC). As a member of BUASC, Justine works hard to ensure Indigenous students on campus have events and activities to join. She is an ideal fit to help other students know that they belong! Justine is a member of the IPC Beading Club, participating with peers, Faculty, Elders and community members on a regular basis. On a personal level, I appreciate Justine’s natural ability to work with children. As a part-time employee at the Brandon University Early Learning Centre (BUELC), Justine provides care for many children of Faculty, staff and students at BU, including my own children. I highly value the mentorship and advice Justine has shared regarding my youngest daughter. As a parent, there is nothing better than when someone just “gets” your child, and loves them all the same! Justine has helped me understand my girl in new ways, which has helped strengthen our relationship. While I enjoy having Justine on campus, I’m excited to see where her academic and professional career takes her! I look forward to seeing Justine honoured alongside other deserving International Women’s Day nominees.